Ted Vayos, BODY: Describe your retail business for our readers. Barbara Coolidge Tibbetts: T. Carolyn is in Northwest Houston. 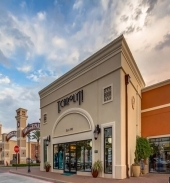 Our original store was located in a strip shopping center 5 blocks from our home. At that time Northwest Houston was an affluent suburban area. With changes in the demographics and traffic becoming more and more of a problem for our customers, many of whom were from out of town and out of state, we made the decision to move to our current location at the end of our 20 year lease. The Vintage Park Shopping Center became our new home. Just four miles north of our original location, maintaining our presence in the same area was important to us. Over the 24 years, many know us as a “mother of the bride” store and because of that uniqueness, our customers come from all 50 states and many foreign countries. Barbara: My daughter, Terrie, and I opened T. Carolyn, a formal wear dress shop, in March of 1991. (Terrie’s name is Teresa Carolyn…hence “T. Carolyn”.) Shortly after opening, a publisher of a franchised Wedding magazine visited our store and suggested we carry dresses for mothers whose children were getting married. She indicated that there was a real need for that “category”. Terrie and I immediately made a trip back to New York and began concentrating on fashions for MOBs and MOGs. No designer or manufacturer at the time knew of any store attempting to “specialize” in that area. In fact, our sanity was questioned…”You gals want to do what?! Every MOB/MOG is hormonally charged and hates her body!” In spite of the warning, we continued on with our plan to dress MOBs and MOGs. I felt comfortable in this field as I had participated as a musician in hundreds of weddings prior to our opening the store. Shortly after moving to our three times larger location we convinced Terrie’s husband, Dante. an Enron casualty, to join our team. He has brought incredible graphic design, print, and computer skills to our business. Additionally, we gave him complete control over our jewelry and accessory department. We would not be where we are today without Dante’s help and besides—it helps to have a little testosterone in a ladies dress shop! Barbara: In the beginning it was not our intention to sell undergarments. We really didn’t have the space for it. As time went on, it became apparent that our customers needed some sort of control garment to make our dresses and gowns look good. That’s when Spanx entered the picture. Several years later, one of our sales reps who also represented a bridal line and a bra line, encouraged us to try her bustier bra which helped restore a more youthful look to our middle aged moms. Because we are dealing primarily with middle aged women who regret not looking like they did when they were brides, comfort and fit are our primary concern. For years we carried Spanx and loved the product, but when the brand started showing up in Target, Lane Bryant, QVC, etc. to name a few, the brand became so readily accessible it encouraged customers to procrastinate. When the Hide and Sleek made by Spanx was pulled off the line to be “improved”, we needed something to replace it quickly as it had been one of our best sellers. We discovered the super power slimmer by Body Hush at the Atlanta VOW Bridal Market. Subsequently, we have done well with this product. Additionally, we have been successful with the Empire bustier bra. It works well reshaping middle-aged bodies. Barbara: Trends in our line of work reflect changes in wedding venues. Once upon a time weddings were primarily held in churches. Not so anymore! Now weddings are held in barns, on yachts, on beaches, in museums, churches and cathedrals, etc. Shabby chic weddings involved burlap, mason jars, and daisies. They are on the way out…thank goodness! Trends for us also involve changing colors though I’m a strong advocate for what’s in style is what’s best on your body! Barbara: Most of our customers are women who are MOBs or MOGs. However, in moving to our larger location it has enabled us to carry more short dresses suitable for showers, rehearsal dinners, etc. We have sold gowns for Inaugural Balls in Washington, D.C., galas, cruises, etc. We have mailed dresses to many foreign countries including Guam, Australia, England, Ireland, Canada, Saudi Arabia, Panama, Norway and Newfoundland to name a few. Barbara: There is no doubt that our web presence has had a tremendous effect on our business (www.tcarolyn.com). Terrie has immersed herself in Social Media, as I have declared myself too old to deal with that aspect of the business!! She has an incredible Blog with very informative articles and has written for Southern Living, Huffington Post, Bridal Guide and Weddings in Houston magazines. I authored a book “I Want My Mother’s Dress to Match the Napkins….Funny Stories and Serious Advice for Looking Your Best at Your Child’s Wedding”, available on Amazon.com and Barnesandnoble.com as well as our website. T. Carolyn and Terrie, Dante and I have been featured in a television series, “Mother of the Bride” resulting from the book and though not yet in America, the show has shown in Canada, Australia, Puerto Rico and has been purchased with rights to show in a total of 35 countries.